Bridging loan default. No win no fee claim help. No win no fee on excessive bridging loan default interest fees. Failed to clear your bridging loan within the allotted time and being charge unrealistic, excessive penalty charges? Our solicitor act on a no win, no fee basis and can reclaim the over payments. We can also offer bridging refinance packages at lower interest. Call today to see if help is on hand. Simply give us a call to explain your situation and to find out if our company solicitors can help reclaim all your over payments through civil courts. 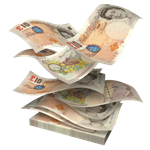 We work on a no win fee basis and claim our expenses as charges to your current loan provider. If we don't get you a refund, you don't pay us a single penny. Get an offer of bridging refinance. Whilst we are working on your behalf to claim back what you have already over paid in fees on your current bridging loan we can offer you a new package to get your interest penalty charges reduced to a normal rate of interest. Closed and open bridging loan deals available to all. What to do with your repayment. If we win on your behalf, as soon as the payment is made to our solicitor's, we will electronically despatch your repayment to you nominated bank account and you can do with this whatever you desire. You'll be better off cash wise and also in interest payments. Even if we can't get your claim through we can offer funding so that you can pay off your current lender and use one of our cheap bridging loans to lower your interest charges and rid yourself of the excessive interest charge you are currently having to pay. If you feel a bridging loan is not for you, we can offer something called a cost effective, flexible revolving credit facility uk where you only pay interest on the amount you have actually used and not on the full amount agreed in the original agreement with us. If you have been forced down the bankruptcy or IVA route because of the extra interest costs, then we can offer low cost IVA loans to stave off a bankruptcy order or to nulify an independent voluntary agreement that you feel forced in to taking. Unfortunately, every lender in panel does not offer any form of regulated funding. All our packages are set up as flexible unregulated bridging loans which means that you as the borrower or any immediate family cannot live in the property used to secure. Bridging finance default interest over charges. If you have failed to clear the whole amount of your bridging loan with another lender and you are being charged excessive interest rates, then our solicitors will work on a no win no fee basis to recoupe the over charge and either get you back in line with your original rate of interest, or we can set you up bridging refinancing to cleaer the loan with them and get you on board with us. Whilst we offer homeowner finance, we are experts in commercial and business bridging loans that can be used for any purpose. It doesn't matter which industry you are in or your credit rating, we can help you bridge the gap with a loan secured on property and based on equity not credit score. Mainstream and High Street banks and building societies no longer offer bridging finance. You need to go through a private bank or through an independent lender. We are a group of independent lenders. We can also accept your application on the phone too without you being obliged to accept any secured loan offered to you. Plus no upfront set up fees. For those that are mortgage free and in need of a short term, high value advance, we can offer a flexible first charge bridging loan with extremely low rates of interest. Choose between closed or open option with our unregulated funding packages today. If you are paying a mortgage or remortgage and need to bridge a financial gap, we can offer you a second charge bridging loan with cost effective rates of interest. Get in touch with us today to find out about this form of funding or if we can offer another borrowing option. In some extreme circumstances and as long as you recevie the correct permission from your 1st and 2nd charge lenders, we can offer a low cost and flexible third charge bridging loan if the advance is used to clear your first or second charge funding packages.